currently under construction at Spring. Sales for available units range in price from $599,950 to $849,950. Stratton Woods unit sizes range from 4095 to 4927 square feet. Stratton Woods has a total of 5 quick move-in homes currently for sale. Stratton Woods is a luxurious enclave of 40 generous home sites located minutes away from the future Grand Parkway and the new Exxon campus. 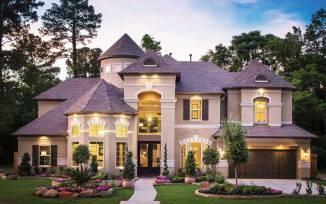 The community offers a distinctive lifestyle within the beautifully landscaped gated entrance. There are also touches of landscaping and community identification throughout the community and a private park, exclusively for residents of Stratton Woods. The community park is nestled in the back of the community and features a shaded pavilion at the entrance and park benches along the tastefully landscaped walking trail. I-45 North to FM 2920 West; North on Gosling Rd to Stratton Woods Rd. (approx. 3.7 miles) on West side of road. Your inquiry will be delivered to the Stratton Woods sales team, who will send you more information about this development.